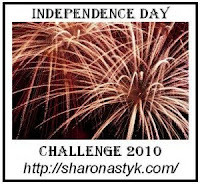 This week has flown by, and here it is, Sunday again and time for my Independence Days Challenge update. No commentary this time, just a report on what I've gotten done. Does finishing the fence for the goats count here? Made a cheesecake using the yogurt cheese. I used a no-bake recipe (yogurt cheese, sugar, & whipped cream) so we could still benefit from the "good bacteria"
Um, two tomatoes planted in walls-of-water?? It's still not 60 here - no independence yet. We have planted out some peas and beans we had started off in the house/greenhouse, and planted a few peas and beans direct into the ground. Some overwintered salad plants add garnishes to sandwiches and meals. Pulled the first few stalks of rhubarb (planted in'08), and stewed it for dessert last night and with this morning's cereal. Still getting enough purple kale for a couple of meals a week. I mince a little ginger and sweat it in a few drops of oil, then chop the washed kale into approx 1 1/2" lengths. Pop the lid on the pan and cook until it is bright green. Beetroot goes well with it. I made a chana dahl with a little pimenton (smoked paprika) for flavouring, which worked well with the kale. On Friday I gave a big handful of kale away to a friend. I'm waiting for her verdict on it. Very cool that you can plant in the fall and harvest in the spring! Your gardening is inspirational! WOW you did a lot this week - I love the sound of your salad ... and I'm always up for roasted veggies!!! - planted out the onion sets.. re-potted the tomato seedlings from the starter cells to larger peat pots - some of them anyway, until I ran out of potting soil and forgot to pick some up. started oregano, thyme and summer savory seeds..
My early radishes, spinach and lettuce are just starting to grow. I'm hoping to have something to harvest in a couple of weeks. I planted my woad seeds :) I put that in the want not category. If I get woad plants, I won't want for blue dye! I've been passing on seeds to a number of people to try growing from seed for the first time! But Sharon, hurray for even two tomato plants! Of course, I don't envy your weather. Mary, you always have such inspirational comments. I should have added overwintered lettuce on sandwiches. In fact, I think I will! Sue, thank you! I love how we inspire and encourage one another. Sara, those are two of my favorites too. My only regret is not trying for 2nd and 3rd spring plantings to extend my salad season. I'm afraid our next stop is "too hot." Nina, you have been so busy. I really need to follow your lead. One of my goals for next year is to get a better seed starting routine. Heck, I just need to get a seed staring routine period! Ooh I'd love to hear about your dwarf cherry guild. Is there comfrey and garlic involved? The season is really ramping up: so much to do! Can't wait to hear about your first chicken egg.